On 19 March 1982 a light aircraft piloted by Andrew Aycock (Ozzy’s band’s tour bus driver) carrying guitarist Randy Rhoads and Rachel Youngblood, the band’s make up designer, crashed while performing low passes over the band’s tour bus. In a prank turned deadly, the left wing of the plane clipped the bus, causing it to crash, killing Rhoads, Aycock, and Youngblood. Randy was only 26, and although he played for only a short period, he has been an immense influence on a whole generation of musicians in heavy rock and metal. Guitar World proclaimed that the guitarist “could have been the greatest”. The Ozzy band were shocked and crushed by the tragedy, but regrouped with a new line-up (Bob Daisley and Lee Kerslake had left the band). 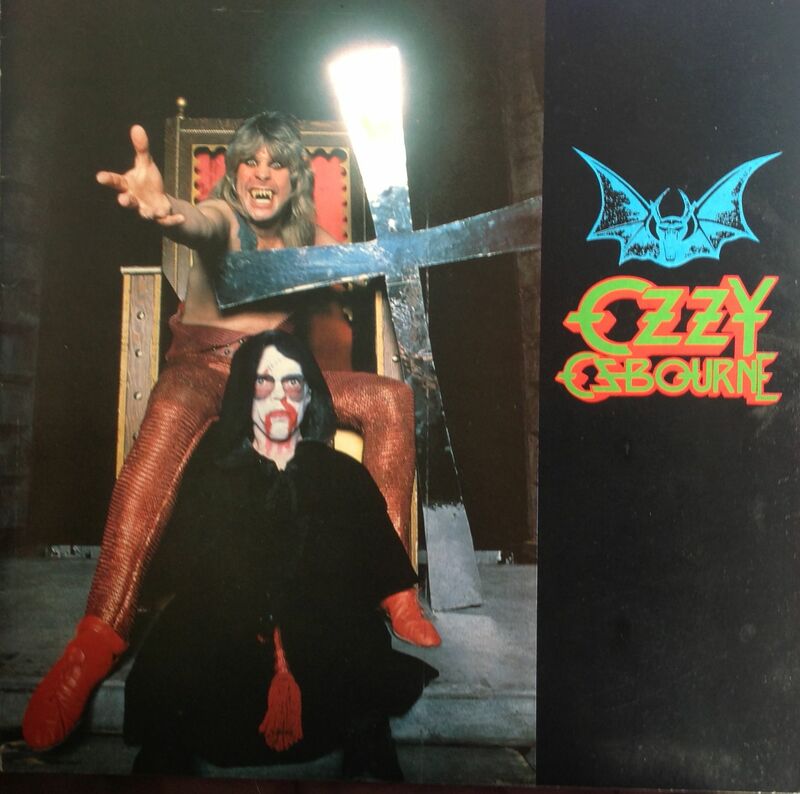 By the time I saw Ozzy again on the Speak of the Devil tour when it called at Newcastle City Hall on 18th December 1982 the band was: Ozzy, Brad Gillis (from San Francisco band Ranger) on guitar, Tommy Alridge (from Black Oak Arkanas, and the Pat Travers Band), Pete Way (UFO) on bass. They were also joined by actor John Allen who was executed in a mock hanging as part of the now highly theatrical stage show. Support once again came from Budgie. From the 1982 tour programme: ” Tragedy struck, and rock lost a great guitar hero and a friend in Randy Rhoads. And yet in the midst of the quiet that followed our loss, there was movement. When the music stopped there was silence. However, it wasn’t a simple silence. It was a silence that would whip itself into a greater sound – a sound that would Speak of the Devil. As time changed me, as time has no doubt changed you, my infatuation with horror made things move faster. The tracks you’ll hear capsulize a real life story that helped cleanse my soul of the 13th anniversary of my career. I am Ozzy Osbourne…and sometimes we all Speak of the Devil”. Setlist: Over the Mountain; Mr. Crowley; Crazy Train; Revelation (Mother Earth); Steal Away (The Night); Suicide Solution; Goodbye to Romance; Flying High Again; Believer; Sweet Leaf; Children of the Grave; Iron Man. Encore: Paranoid. Ozzy was back in Newcastle on 18th November 1983 at the Mayfair for the Bark at the Moon tour with support from Heavy Petting. 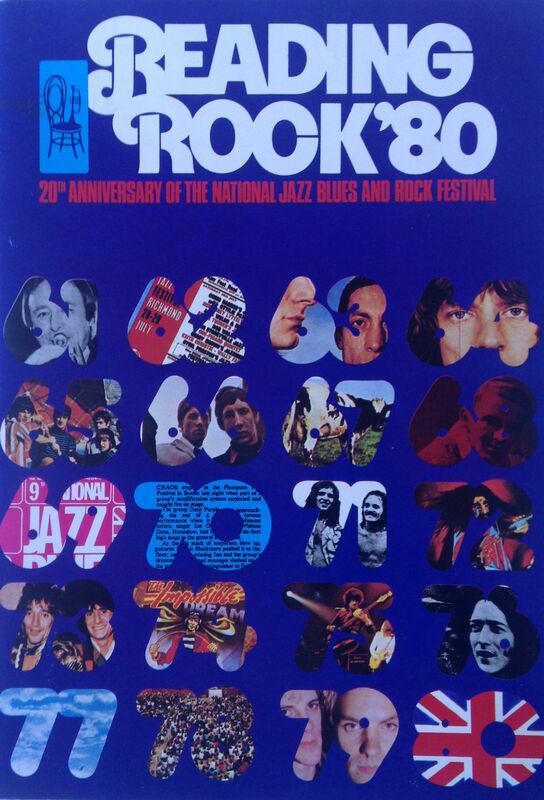 The line-up had changed again and was Ozzy, Jek E Lee on guitar, the return of Bob Daisley on bass, Don Airey on keyboards, and the legend Carmine Appice (Beck, Bogert and Appice; Vanilla Fudge) on drums. 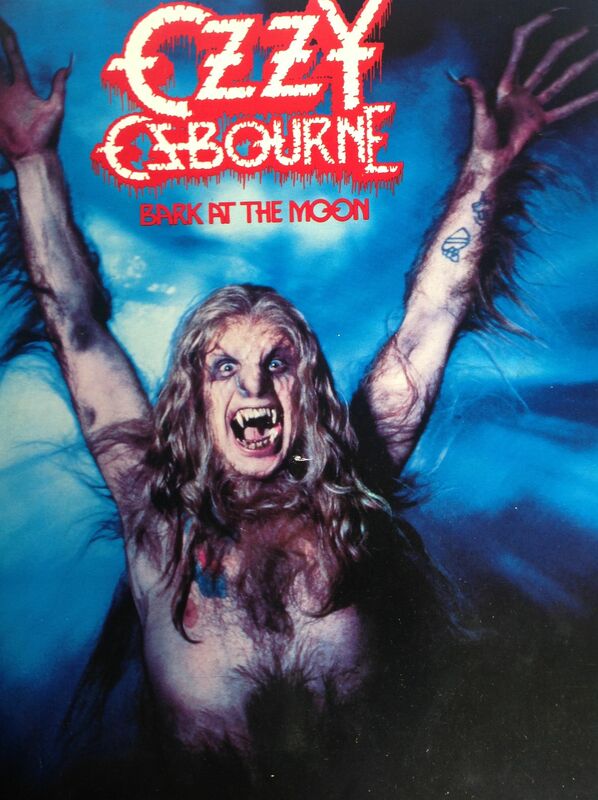 Ozzy had morphed into a werewolf, and the show was even more theatrical. I saw the show again as part of the 1984 Monsters of Rock festival at Donington where Ozzy joined a bill headed by AC/DC and also featuring Van Halen; Gary Moore; Y&T; Accept; and Mötley Crüe. 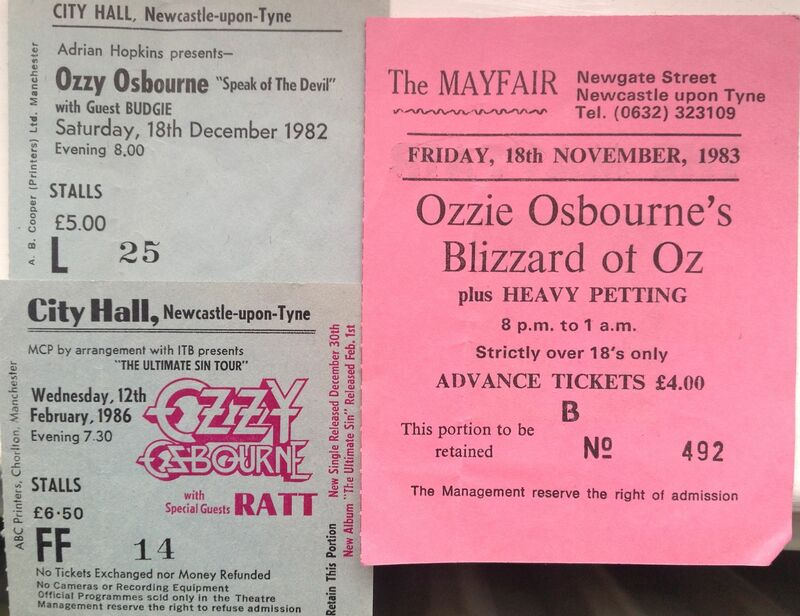 Two years later I saw Ozzy again; back at Newcastle City Hall on 12th February 1986. Support came from US rockers Ratt. A new tour and yet another line-up: Ozzy; Jake E Lee remaining on guitar; Phil Soussan on bass; the late Randy Castillo on drums (who went on to join Motley Crue) and John Sinclair on keyboards. 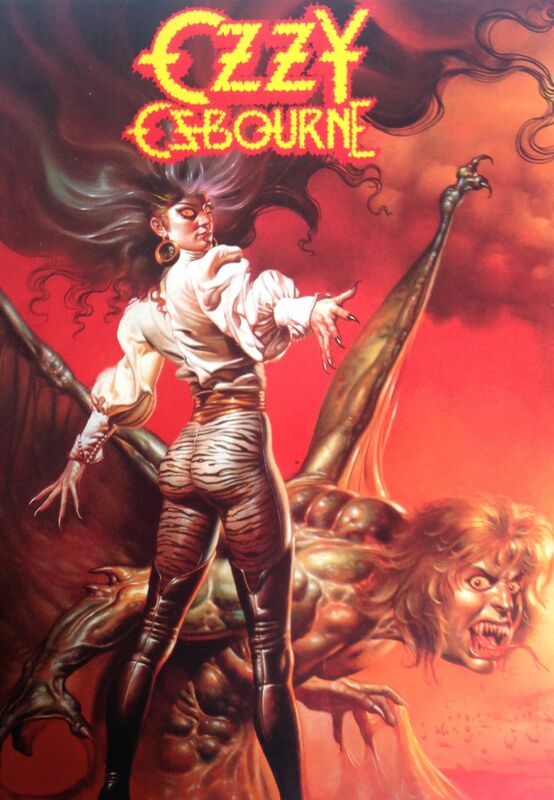 The tour was in support of The Ultimate Sin album. From the programme: “”Ozzy Osbourne is still the reigning madman of rock’n’roll. He’s still an intense performer who often pushes himself too far……The music’s great, the band is hot and we’re ready to take on the world”. Setlist: O Fortuna; Bark at the Moon; Suicide Solution; Never Know Why; Mr. Crowley; Shot in the Dark; I Don’t Know; Killer of Giants; Thank God for the Bomb; Flying High Again; Secret Loser; Iron Man; Crazy Train; Paranoid. This was the last time I saw Ozzy live until the current Black Sabbath tour. Ozzy’s visits to the UK became less and less frequent as he concentrated on the US. I did have a ticket to see him at Newcastle Arena 10 years or so ago, but the concert was cancelled as Ozzy was not well at the time. Ozzy is a great heavy rock singer, and a crazy and compelling front man whose stage presence is as powerful today as it ever was. When Ozzy left Black Sabbath in 1979 I honestly thought it could be the last we saw of him. Sure; he was a great, mad front man in Sabbath, but I really didn’t see him as a solo act. Ozzy always struck me as crazy, fearless, yet almost child-like. He fitted well within the Sabbath context, and as part of a group; but on his own? How wrong I was. No-one could have predicted just how successful his career would turn out to be. But it was obvious from the first time I saw him in concert and heard him play his new songs that Ozzy was going to be OK, more than OK in fact. The new album had some great tracks in “Crazy Train”; “Goodbye to Romance”; and “Mr. Crowley”, and he included Sabbath favourites “Iron Man”; “Children of the Grave”; and “Paranoid” in the live show, so how could he not be great. Oh, and Randy Rhoads was a simply incredible guitarist, just as good as his legend suggests. The tour called at Newcastle City Hall, Newcastle Mayfair and Sunderland Mayfair. Now this is another one of those gigs that has tested my memory; which has been playing tricks on me again. Now in my mind I went to see Ozzy at the City Hall concert; but I can’t find a ticket for that show, and I always keep them. 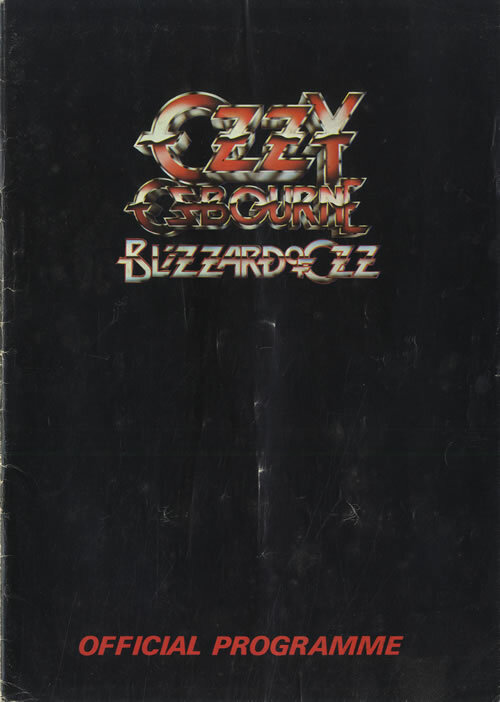 I do have a programme so I know that I did see Ozzy that year, and on that tour, and I can definitely remember it was shortly after the Blizzard of Oz album was released. I can only conclude that I must have gone to the Sunderland Mayfair gig, and I either paid at the door or tickets were collected on the way in. I’m learning just to accept things like that now; I can’t always remember details fully these days, and it’s no good dwelling on them or trying to figure it out; it just drives me nuts 🙂 . The line-up of Blizzard of Ozz was Ozzy (of course) on vocals, the late and truly great guitarist Randy Rhoads; Bob Daisley from Rainbow on bass, Lee Kerslake fom Uriah Heep on drums and local lad Don Airey on keyboards (replaced by Lindsey Bridgewater for the tour). Support came from those excellent Welsh rock heroes Budgie. My first memories of Budgie were seeing their name on the bill at the 1972 Lincoln festival. I was at the festival and noticed in the programme that they were playing in the Giants of Tomorrow tent. I remember thinking that Budgie was a strange name for a band. I can’t remember if I actually went to see them; I suspect not, as I spend most of the time in front of the main stage. The next time that Budgie came onto my radar was an appearance on The Old Grey Whistle Test. They played Breadfan and the riff just blew me away. My friend had the album Never Turn Your Back on a Friend, and I spent hours practising and learning the riff. Not long after that I went to see them at the local Locarno ballroom in Sunderland. Seem to remember they started with Breadfan, and played it again as an encore. But they had other great rock songs: Parents, Zoom Club, In the grip of the tyre-fitters hand. The album Never Turn your Back on a Friend is a classic, which I played again and again at the time. Burke Shelley has a unique vocal style. 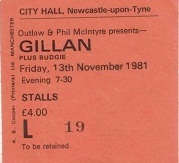 By 1977 Budgie were a regular on the concert hall circuit and often played at Newcastle City Hall. By 1978 guitarist Tony Bourge had left the band, and original drummer Ray Philips had also departed some time ago. Burke Shelley kept the band going, and signed up new guitarist Robert Kendrick. I went to see Budgie twice at the City Hall in 1978. They were still drawing a respectable crowd, but not filling the place, and I was beginning to feel that their time had passed. However, the dawn of the New Wave of British Heavy Metal gave a kick start to their career and a spot at the 1980 Reading Festival, where I saw them play on the Sunday afternoon, kept them in the minds of heavy rock fans. 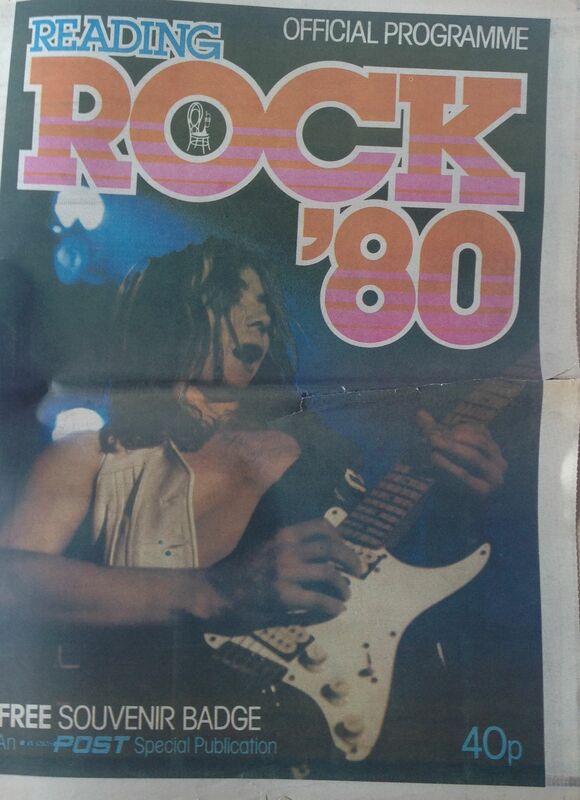 They returned to headline Reading in 1982, a gig I sadly missed. It was to be over 20 years before I saw Budgie again. In fact the band all but disbanded in the late 80s, concentrating on studio work, and not gigging at all. They returned in the late 90s and started touring the UK again around 10 years ago. Will and I took the chance to see them when they last came to Newcastle in 2005 to play at Trillians Rock Bar, which used to be The Man on the Moon pub in the 70s. The set consisted of some new tracks but the old favourites: Parents, Zoom Club, and of course Breadfan all featured. They were loud, in fact very loud, and the guitarist Simon Lees was excellent. Burke Shelley’s screeching vocals were as strong as ever and he played and looked great. It was really good to see them again. 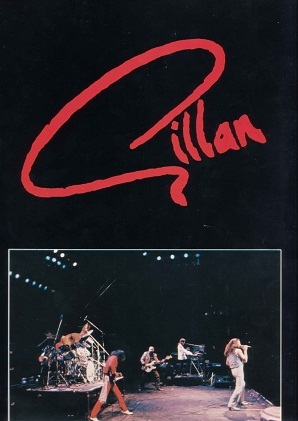 Will and I had tickets to see them again at Trillians a few years later, but the gig was sadly cancelled. The last I heard was that Burke Shelley had taken ill while on tour in Poland. The rest of the tour was cancelled and Burke returned home to recover. Hope he’s OK. Budgie are often forgotten, and are never given the credit they deserve. They were a pretty good solid rock band, who I remember with some fondness. Hope I get to see them again one day. I’ve just found a very old (and very small) programme from the Never Turn Your Back on a Friend tour. I must have got this (probably free) at Sunderland Locarno or Newcastle Mayfair in the early 70s. I didn’t know I had it. I’ve scanned it and added it to the post (see right).